After breakfast, we will begin our visit heading to Telouete by means of the high atlas mountain Tizi-N-tichka which reachs 2,260 m. We will visit Kasbah in the same range, called Pacha Glaoui, there we'll eat. 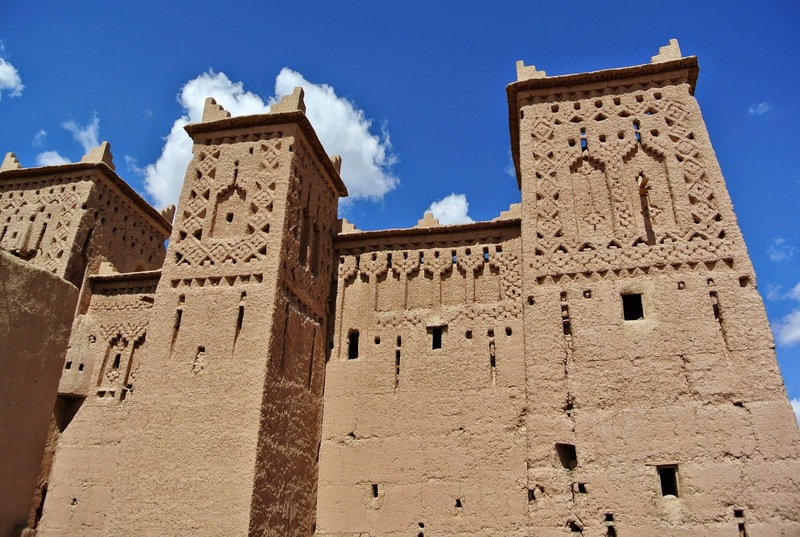 In evening we will take the way that tracks to Ait Benhaddou Kasbah, crossing Ounila valley with its Berber towns, and Proceeding to Ouarzazate. Supper and overnight in hotel. After breakfast, we will drive to Agdez crossing the anti-Atlas at 1660 altitude, proceeding with towards Zagora through Draa valley with its parade of palm trees, while passing by many typical Berber villages. Upon arrival to Zagora, we will have lunch in a restaurant. Toward the evening we'll drive to Tamgroute, where we will visit old Koranic library, then proceed to the kasbah underground and the Production of ceramics. Come back To Zagora for supper and night in an inn. After breakfast , we travel to Merzouga, passing again through Draa valley joining a track which does towards the town of Taftechna and the town of Ait Ouaazique with its etchers repestres , and Berber town called Tazarine, proceeding to Alnif , where we will eat . After lunch we proceed towards the great ridges of Merzouga ( Erg Chebbi) by means of Rissani. 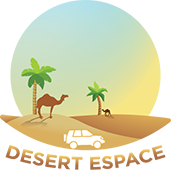 At that point we will change from our vehicle to camels. We'll be tackled a camel ride on the dunes to enjoy the sunset. Our supper and overnight today will be in traditional nomad bivouac in the heart of the dunes under thousands of stars and moon light. 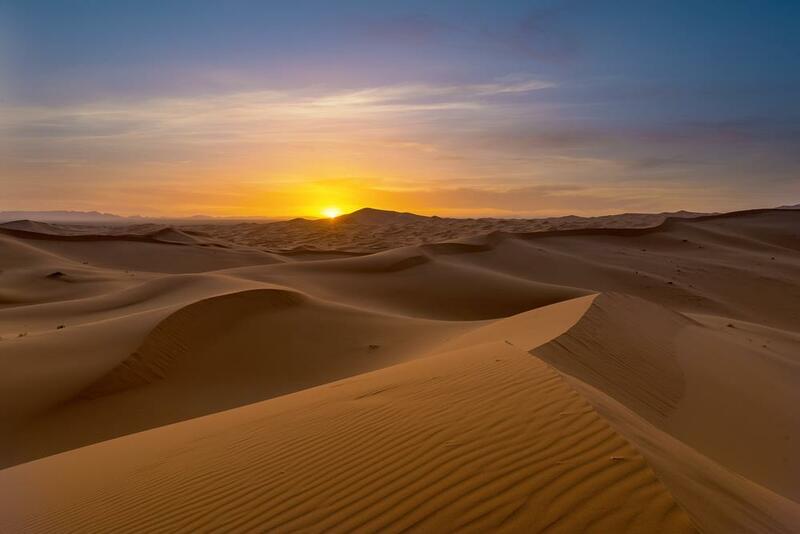 We will wake up early in the morning, in order to admire the sunrise and return on camels to the bottom of the dunes after breakfast, we will take a track which completes towards the town of Erfoud. We will cross the palm plantation of Touroug, making a beeline for Tinjdad where we will eat. Toward the evening we proceed towards the Todra Gorges where you will have a hike around it, Supper and night in an inn there. After breakfast, we will go to Boumalne towards the Dades Gorege, Vally Roses, Kelaat Mgouna, where you will have lunch, then drive to Skoura to visit Amredile Kasbah, after the visit we keep on ouarzazate for supper and night in an hotel. 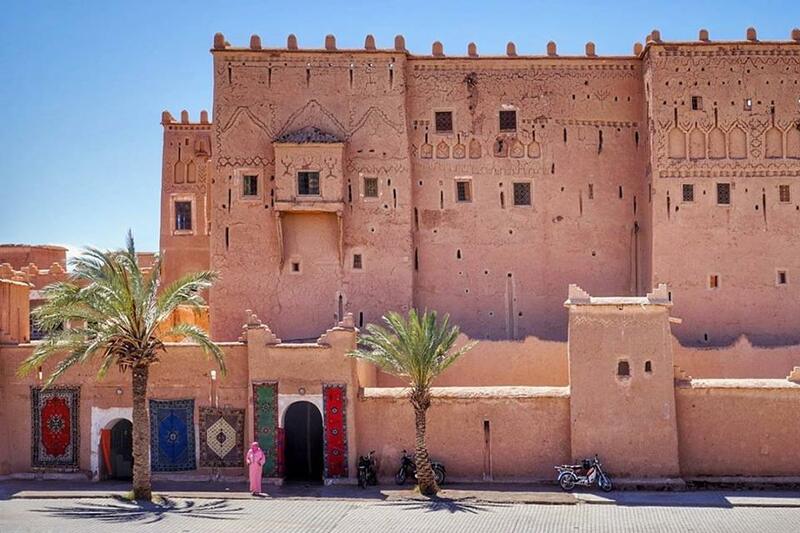 After breakfast, we'll make a visit to town of Ouarzazate, then keep way to kasbah of Taourirt and silver screen studio, before we drive back to Marrakesh by means of Tizi N-Tichka high mountains, where we will end the visit.